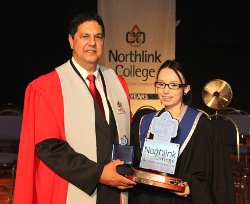 Parow Campus’s Legal Secretary student, Stephanie Boonzaaier, received the Chief Executive Officer (CEO) Award at the Annual Northlink College Student Award Ceremony which was held on Friday, 24 May 2013 at the Cape Events Centre, His People’s Church in Goodwood. More than 600 students accompanied by their parents, guardians, friends and partners, attended the Ceremony to receive their Certificates and Diplomas that marked the end of their courses. Stephanie was born and raised in Tableview and she first heard about the College through a friend. Boonzaaier applied to study at Northlink College when she was informed that there was no space in the course. She tried other avenues until a Northlink lecturer called her to give her the good news in 2010. she immediately took up the offer and started the Legal Secretary course at the College. Her average at the end of her course was 89.25% she really did her parents, lecturers and Northlink proud. She speaks profoundly of her lecturers and thanked them for being a motivation to her throughout her course. When asked how she balances her social and student life she said: “I soon realised that if I wanted to be successful, I needed to make certain things non-negotiable and decided to revise daily after every chapter. It helped me a lot because when I wrote tests and exams I basically knew my work.” Her parents and brother were also a motivation for her to always do well, they were by her side when she received the Best Business Studies Report 191FET College Achiever Award along with the Premiers Award as overall Report 191 Top Student, on 18 February 2013 at the Western Cape FET Colleges Ceremony held at Tygerberg Campus and recently the CEO Award. The CEO Award included a laptop and a cash prize. “I never thought I would receive a special award especially the CEO Award, it was always my objective to work hard and not to stand out above all my peers. I was very surprised and it was a bit unexpected, but I regard it as a bonus,” added Stephanie. Other than studying and socialising she also has a hobby which is horse riding and would like to get back into it in due course. If all goes well she would like to continue her studies next year through the University of South Africa (UNISA) to pursue a career in Law. Stephanie has a passion for supporting children and animal rights (to stand up and fight for humans and living objects that cannot defend themselves). She sees herself working at a law firm as a legal secretary with the eventuality of becoming a lawyer. “If you study and work hard daily, your load of work will become less and you will have enough time to take part in all the other fun activities in order to balance your life,” adds Stephanie. “We are glad that we have once again managed to successfully organise an Award Ceremony with guest speaker Ayanda Tini (GoodHope FM) and Sandy September (Radio Tygerberg) as the master of ceremony. The College would like to wish Stephanie and all the other graduates the best in pursuing their future careers,” said Rene Bonzet Northlink College HoD: Communication, Marketing and Advancement.